From February 6 through 8, Valbonne celebrated the St. Blaise festival, a weekend dedicated to products of the land, such as wines, cheeses, olive oils, honey, and other tasty stuff. 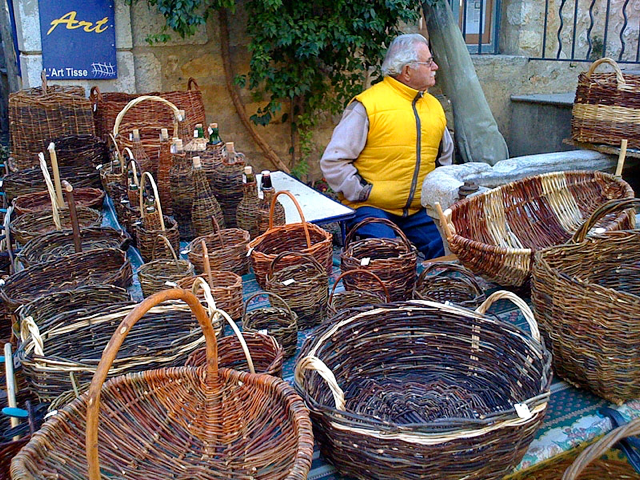 Only few of the items for sale, such as the baskets in this photo, were not edible. Many people dressed up in regional costumes, and groups of street musicians alternated with flower floats in making their way through those narrow village streets that had not been converted into an open-air market. The Valbonne heritage museum was offering free tours, many children activities were planned, the local boy scouts showed off some of their skills, and even a few rides were set up on the edge of the village. From the looks of it, a good time was had by all.